Show proper care, use, and storage of all working tools and equipment that you own or use at home or school. Use a saw, plane, plane, hammer, brace, and bit, make something useful of wood. Cut parts from lumber that you have squared and measured from working drawings. 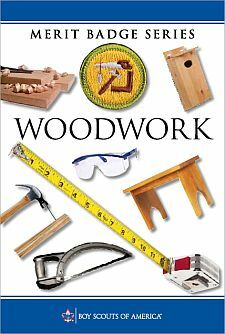 Create your own woodworking project. Begin by making working drawings, list the materials you will need to complete your project, and then build your project. Keep track of the time you spend and the cot of the mterials. Make working drawings of a project needing miter, dowel, or mortise and tenon joints and build it. Make a cabinet, box, or something else with a door or lid fastened with inset hinges. Help make and repair wooden toys for underprivileged children OR help carry out a woodworking service project approved by your counselor for a charitable organization.